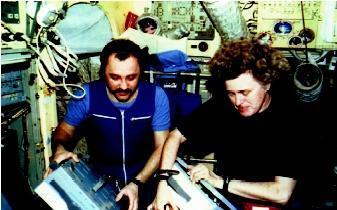 Amerian astronaut Shannon Lucid and Russian cosmonaut Yuri Usachev prepare a meal on the Russian space station Mir in 1996. Cosmonaut Valeri Polyakov, who drank recycled water for 18 months while living onboard the Mir, said it tasted very good. SEE ALSO Mars, Water on ; Reclamation and Reuse ; Solar System, Water in the.